Submitted by Rocket Jones on Sun, 2008-08-03 02:25. I created this vertical 3x5 card to keep track of information about my pen pals. The top section is for the snail mail address, the middle section is for notes about the person, and the bottom section can tell you at a glance when you sent or received the last letter. I leave the back blank for extra notes. There's not much room on a 3x5, so in order to get full-size printing on my printer I have to print these to classic sized paper (two per sheet) and then cut them to size. There's just enough margin on the left side for circa if you want that. I've included both Open Office and Adobe .pdf versions. Submitted by adult80d on Tue, 2007-08-07 00:53. When my son was born in October 2005 I began to think about how little I knew about my parents past. What were they like when they were younger, how did they feel when I was born, where did they live, who were their friends, etc... So I started to think about my own life in a timeline. I started piecing together information in different categories - where I went to school, where we lived growing up, events in my life, travel, occupation, etc... After gathering all the information I began to put it into a timeline so I developed these blank templates for making my timeline and I thought I would share them with others interested in timelining so they could benefit from them. Submitted by Sardonios on Mon, 2007-07-16 06:00. Ah sir, if I were a fool, a flapdoodle, a jester I would walk into any famous office supply emporium and demand that they sold me a Bic Crystal of the highest calibre. But no sir! I am a man of the highest intellect and demand a pen to prove it. Submitted by Tournevis on Fri, 2007-02-23 01:41. I have a very long French name and I got tired of spelling it out only to have it mispelled anyway. So I made this card and now my name is not mispelled anymore. Ygor pointed out a booboo, so I fixed it. Submitted by Sara on Tue, 2007-02-13 08:19. It was a chance meeting; a case of the right place at the right time. I was sitting at my desk at work, not looking for love, when I meandered my way into its richly informative pages. There was instantaneous chemistry. I was looking for information and it responded to my every whim. I was love-struck from the first day, just two weeks ago. Imagine my surprise to hear that www.lifehacker.com may be one of the sites that is commonly â€œtaken for granted.â€ If you are one of the siteâ€™s frequent visitors, you may know much of what is coming. Perhaps this SpotLink will rekindle your relationship. If you have never visited or searched the site in depth, the following may be enough to spark a new love affair. (Donâ€™t worry; Iâ€™m not the jealous type). â€œComputers make us more productive. Yeah, right. Lifehacker recommends the software downloads and web sites that actually save time. 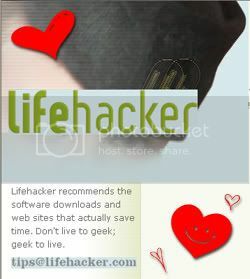 Donâ€™t live to geek, geek to live.â€ ~Quote from Lifehacker.com. Submitted by Sara on Tue, 2007-02-06 20:55. Greetings fellow DIY Planner junkies! Many of you have encountered me in the hallowed halls of our forums. You may even have noted my abnormal love of links. Doug and Innowen sure noticed and have graciously crowned me "Link Wrangler" (or "Link Liaison, if I may be so bold) for DIYPlanner.com. This "position" has been created to organize relevant links for everyone's use. I'm sure you are aware of how tedious it can be to find "that one site" in a pinch. Hopefully, I will be able to ease some of that frustration. It is with great pleasure that I present my first "SPOTLINK," or featured website. Submitted by cruss on Fri, 2007-01-05 15:27. This is the standard "Cornell Notes" from the v3 Notes package with the title changed to "Meeting Notes" and the grid replaced with lines. I originally did this modification to go with the Compact Meeting form but thought someone might find it useful on it's own.